I ride a 2008 GL18 that I bought new and still love. What I don’t love is that Honda only offers a GPS update that’s over four years old (2014.40). I talked to the folks at Garmin and they said Honda has not “authorized” a newer update for this system. I will not pay $95 for a four-year old GPS update. What I want to know is, why Honda is blocking the creation of a new update for this system? Has Goldwingdocs or any other Goldwing rider group ever lobbied Honda to fix this problem and if so, what was the response? Does anyone know a Honda America executive we can focus on to complain to and maybe influence to move the needle on this? Based on the number of posts on the “GPS Update” topic, it appears there are many, many others who are as frustrated as I am by the situation. I found the GPS in my 'Wing to be too difficult to "program". Must be stopped, takes too long to button push to make inputs. I just bought an automotive GPS (Garmin Drive 51 LM). Easy to enter info, lifetime maps and while it is not waterproof, it is removeable to take inside with us at home and on the road. But I am with you, it would be nice if there were an easy and simple plug in for map updates. One thing I find unacceptable with the OEM navigation is that you cannot even turn it on if you are riding! I must have 25 or more buttons on my 'Wing that Honda allows me to manipulate while moving but I have to stop and be in neutral to even turn the navigation/GPS on. I read about someone who just applied the map updates from a Garmin GPS to the card for the bike, how he got it to work, I can't recall. he gave some in depth instructions, but I can't find that thread now. he talks about how to copy the MapSource file and use it to replace the map file in the bike's gps. if it will work for him, it should work for you. Thank you both for your comments, I appreciate your efforts to help. That said, I’m not interested in trying to hack my way to an update or avoid paying for one. As you can see from the thread, finding a workaround for the update is complex and many appear to have run into problems along the way. I’ve seen these and other threads and none appear to be straightforward and reliable. Notwithstanding the fact the Navi system on the ‘08 is not the easiest or most intuitive to operate and you have to be stopped to turn it on, I will pay for an update if it’s current - even if somewhat pricey at $95. The issue appears to be Honda and there doesn’t seem to be an explanation for why we can’t buy a current GPS update — at any price. On another forum at one of our "Meet & Greets" and member updated my 06 with newer firmware and 2018 maps. Everything still works the same and they are not the best gps units but my maps are updated and that a big help with new roads. Maybe someone will chime in with the answers but I think a lot of it comes down to putting it out on the web that you have a copy of maps and firmware that been " borrowed"
Even if Honda comes out with an update, it will not be complete. The maps for 2006 to 2008 US model bikes and 2006 to 2010 CDN model bikes are on CF cards. Some here have been able to put larger than 2 GB cards in their units and have them work, but most of us cannot. With a 2GB CF card, only a large portion of the US maps can be contained. If Canada or Mexico are wanted, then only a small portion of the US can be added to that. Since Honda has stopped producing updates, hacking the system and putting our own maps on is more than acceptable. We went through this with Honda and Garmin about seven years ago, and they brought out updates till the CF units in the US became more than 8 years old (manufacture dates) and then seem to have stopped. With a bit of computer knowledge, and the right card drives, building and installing up to date maps is possible. To get what the unit came with needs either a 4 GB card or two 2 GB cards, with the maps split. Sorry I cannot be of more assistance, but the info to do this is already on this site, and AZ1800 did point to several threads on it. It should be noted that when Honda/Garmin did bring out updates, the maps on the updates were over two years old. That would mean that a bike with four year old maps is still only two years out of date according to Honda/Garmin. Thanks themainviking, this is the best explanation I’ve seen for why the problem exists. I’m curious, has Honda ever officially communicated why they’ve stopped putting out the updates, or is your explanation based on your many interactions with them and Garmin over the years? My experience drives my comments. Honda is not very forthcoming with information, and the only way I actually ever got an answer from Garmin was by keyholing one of their reps at a Wing Ding where they were bragging up their latest Sumo. I bought their very first update when it first came out, and three months later they replaced it, as it was screwed up. The maps were two years out of date on that first one and have not been any better. The only way to get up to date maps is to make them ourselves. Garmin brings out a CNANT update (City Navigator on disk) three or four times a year, and the maps are up to date as of the date of release of those disks. These are where your most up to date maps are going to come from. Keep in mind that even the CNANT updated maps are probably a year old, as first they have to find corrections, and Garmin does not do this. Another company does this, and then sells the info to Garmin, Magellan, Tom Tom and the others, who then build their mapping bases from it. Any OEM GPS is going to be out of date, probably the day you buy the vehicle. Some companies are faithful about updating them, but most are not. It is not big on their radars. And they charge in the neighborhood of $400 plus for these updates, as they do not sell all that many. 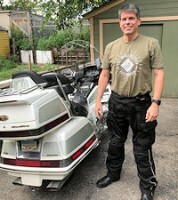 Most people do not use the GPS in their cars, unlike us on our motorcycles, who actually tour and want to know where we are and where we are going. With all this said, GPS is still probably more up to date than a paper map, if you can find such a thing any more, LMFAO. Printed out Google maps are probably the best we could ever get, but to print out a full map takes a ream of paper if you wish to be able to see the roads. I also have a 2008 with GPS and rarely use it to actually navigate. I had a car gps on my GL1500 and it was useful, until it finally died. Nowadays, with Smartphone having almost every gadget available, I use the GPS function of my IPhone, have power and AUX input for the phone and a really good phone holder from RAM mounts. Just used the IPhone as my GPS for a 5500 mile round trip between home in PA and Bear Tooth Mountain Pass in Montana. I also did carry an Atlas and used it to better define routes to plan. Not looking to bother with upgrading the CF card..not worth my time or money! I too was disappointment that Honda decided to no longer support the older wings GPS. It could be that Garman will pick up the slack if they are poked enough? Garmin could care less, won't happen. It was never Honda that supported the older wings in the first place to my knowledge. It was Garmin, but with consultation with Honda. Maybe a little nudge from the fair retail practices government agency might have had a bit to do with getting them off their butts, as I did put a report in and got an action indication, but again, maybe not. Garmin sells/sold the updates for $95. When Honda sold updates, the cheapest I found from them was $265. Any updates I got for my OEM GPS came from Garmin. Then I began making my own, because Garmins were two year old maps. The only thing I lost was the ability to do searches by POI. Everything else worked as it did before I built my own maps. I did not do this to cheat anyone of their money for updates, as purchasing the CNANT disks did cost money. I did it to get updates that were up to date. Since the maps have had to be split to two CF cards, I have really curtailed my work on keeping up to date. It just got to be too much work. This is probably why Garmin and Honda have ceased updating. The money is not commensurate with the required labor. My experience drives my comments. Honda is not very forthcoming with information, and the only way I actually ever got an answer from Garmin was by keyholing one of their reps at a Wing Ding where they were bragging up their latest Sumo. I bought their very first update when it first came out, and three months later they replaced it, as it was screwed up. The maps were two years out of date on that first one and have not been any better. The only way to get up to date maps is to make them ourselves. Garmin brings out a CNANT update (City Navigator on disk) three or four times a year, and the maps are up to date as of the date of release of those disks. These are where your most up to date maps are going to come from. Keep in mind that even the CNANT updated maps are probably a year old, as first they have to find corrections, and Garmin does not do this. Another company does this, and then sells the info to Garmin, Magellan, Tom Tom and the others, who then build their mapping bases from it. Mostly correct. Most GPS companies buy their mapping data from other companies. Garmin, for instance, buys its mapping data from Navteq, so it depends on Navteq to issue updates. TomTom on the other hand bought the mapping company Tele Atlas in 2008 (after winning a bidding war with Garmin), so it both owns its own mapping data company, plus sells that mapping data to other companies. Thank you Scott, for raising my awareness about Tom Tom. I was not aware that they had purchased Tele Atlas, resulting in my comments being a bit out of date. NavTeq does indeed supply Garmin with the updated data, and I believe they also supply Magellan. It is curious tho, that NavTeq GPS units are so poor and the mapping is no more up to date than the others. Methinks perhaps NavTeq may not make their own GPS units, even tho they consolidate the update info. I've had similar experience with my 2009 GL1800 here in New Zealand. Niether Garmin or Honda want anything to do with the GPS. My workaround so far is to use OpenStreetMap (https://www.openstreetmap.org/#map=2/-41.2/-6.6) which is a fairly painless experience if you are happy downloading the updated maps and copying it onto the CF card. I've even been on the site, updated (drawn in a missing road), downloaded again and hey presto there's the new road on the GPS. What I am really looking for is the updated firmware. Is 2.8 the latest and does anyone have a copy of it please? It's only a single file (I think it's gupdate.gcd and is about 3mb big). Any help much appreciated. You all are not alone, I have a 2015 GL1800 with Navigation only because I had to buy it in order to get ABS brakes. The last update to the maps were in 2016 and nothing else has or will come out. When I think about Honda's business practices I get really mad and will probably change brands in the future. No, no update for another GPS. The one in the bike already is very extensive and the big items in it wont change quickly..Things like hwy exits or ramps, motels, police, hospital, govt agency's..I'm not so worried about gas stations or fast food places moving. I could use the bikes GPS for 20 years and still find it useful. I used the dongle in the left pocket that receives music, etc from an MP3 Player. I purchased a $20 Bluetooth Transmitter (Indigo BTR9 Stereo Transmitter "set to receive") that receives music from my phone and at the same time can run the Google Maps in the background. Yes... the lovely lady politely interrupts my music to advise of the next turn, etc then the music continues. I have a 2012 Level 4 GL1800 and the programming of directions are a pain. Yes, you can program your destination into the chip and plug back in for specific trips but that has become a pain. So using my cell phone works for me. Any chance of posting the link to the site so I can give it a try? INDIGO BTR9 Transmitter. Got mine on Amazon.com. Like I said, works great for listening to my Iheart Radio from my cell phone along with receiving directions from Google Maps. Just plug it onto the small dongle in the left pocket, set the transmitter to receive data from your phone using bluetooth. Hi Gl18pilot, I own a Canadian 2013 Airbag GL1800 model and I to have been frustrated by Garmin and Mother Honda for not give us Wing owners a satisfactory access to a current map update. In fact I wrote Garmin and gave them a lucrative money making idea. You see even though I have a OEM/Garmin GPS I, like many others have also mounted a stand alone GPS. I have a Garmin Zumo 550 on my Wing, which by the way has Lifetime maps. At present my Zumo has 2019.20 maps. 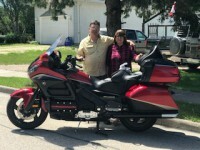 I wrote Garmin and said they should offer all navi equipped Gold Wing owners life time maps for their OEM/Garmin GPS. I was not suggesting it should be free but charge a fair price to get free updates just like the other Garmin GPS's that come with free updates. I would be willing to pay $150 for such a privilege and it could very easily be done through Garmin Express using your SD card used by the wing's GPS. Sadly I got a generic email saying thanks for my suggestion and they would look into it! IMHO this could really be a money maker for Garmin. Now I know the 1st gen Gold Wings use a different set up than my 2nd gem Wing but I see no reason why Garmin could not do this. Come on Garmin, step up and do what's right. Selling us 2 to 4 year old maps for $95 is totally pathetic. A friend of mine who owns a 2017 Level 3 Wing show'd me his map set and it listed it as 2015.2 and this was bought right off the showroom floor. If I recall correctly it took a couple of tries to get it right. I always kept my original as a backup just in case. And here are a couple other threads from the GL 1800 Riders forum referring to the update.